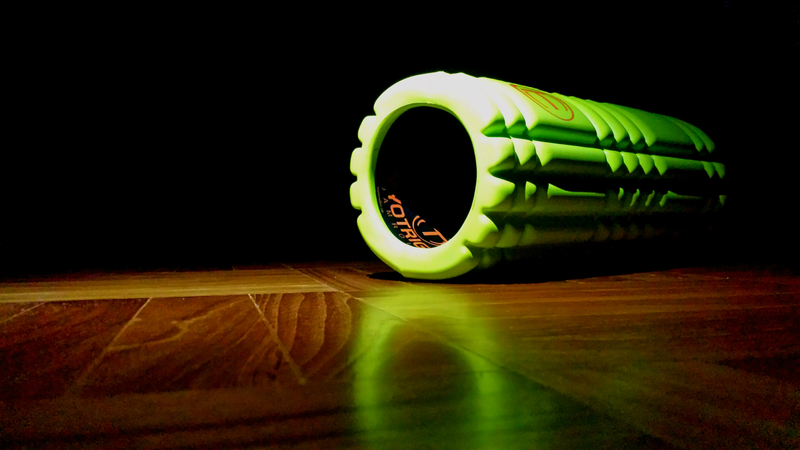 →Foam Rolling – why the pain??? Foam Rolling – why the pain??? Foam rolling is a method of self myofascial release using a cylindrical foam roller. It is an inexpensive and convenient adjunct to help with the maintenance of mobility and healthy muscle tissue. Foam rollers themselves can vary in size and texture but all do a similar job, though you can be more specific with some of the more textured rollers. They can be found in most gyms but are a useful and compact piece of equipment to have in your home. A foam roller uses similar principles to that of massage through physical manipulation of the tissue to help release knots and reduce muscular tension. However, instead of a therapist applying the pressure, you use your own body weight to affect the area of the muscle you are rolling. You can alter your position on the roller to target specific areas of the muscle whilst rolling back and forth. Foam rolling cannot completely replace the skill and accuracy of a massage therapist but can help to reduce the amount of time (and money!) you may need to spend seeing one. For those frequent gym attendees you may be acquainted with that delayed stiff and achy feeling in your muscles that builds up a day or two post workout. It tends to occur after a particularly hard session or, more commonly after integrating a new exercise into your regime. This is known as DOMS (Delayed Onset of Muscle Soreness). It not only limits our ability to exercise but can interfere with daily tasks. (I’ve definitely struggled up and down the stairs after a hard session). The soreness felt is secondary to micro-tears in the muscle fibers followed by an inflammatory response and chemical reaction. It can cause discomfort and stiffness for up to a week unless treated with massage therapy or a foam roller. The increased blood flow provided through rolling, can help remove waste products from the tissues, helping your muscles to move more easily again and therefore can decrease your recovery time. When our muscles become more pliable we in turn increase our flexibility which can help with decreasing our risk of injury. Many of us spend long hours in the day sitting in front of screens, (or we may be on our feet for work, but get home to wind down by slumping for several hours on the sofa). It’s very easy to lose your postural awareness and before you know it you’ve slouched over your screen for hours at a time. Over time these repeated positions can cause respective lengthening and shortening of certain muscle groups resulting in a deviation of our posture from our optimal mechanical position. For example, in slouching at our desks with our chins poking forwards and our shoulders and upper back rounded, the pecs muscles in our chests tighten and the rhomboids and trapezius in our upper back lengthen. Long periods of sitting also tend to tighten our hip flexors and hamstrings. Using a foam roller to lengthen the shortened muscle groups can help to oppose these daily dysfunctional positions and therefore improve our posture. The exact process behind foam rolling is still up for debate, but it is evidenced by its affects. Knots or trigger points are hyper-irritable points in the muscle or fascia surrounding it. You can palpate them as nodules in tight bands of muscle. Trigger points are characterised by a referral pattern where by pain can be felt (but not always) at a point further away. For example, some headaches can be caused by tight muscles in the neck due to referral from these muscles. Trigger points are differentiated from muscle spasm as they only occur in a small part of the muscle, whereas muscle spasm will involve tightness in the whole muscle. They can occur as a result of injury, excessive or unusual exercise or following persistent overload of the muscle i.e. those used to maintain posture due to poor sitting or working habits. Repetitive tasks at work or home can also be a cause. These trigger points can be released using the foam roller to pressure them. In smaller areas such as the neck, more benefit may be gained by using a massage ball. Fascia is a continuous network of connective tissue that envelopes and separates our muscles, bones and organs in one long connected structure. In order for fascia to function correctly it needs to be able to glide smoothly over the tissues that it surrounds. Through excessive postural or mechanical stress the fascia can get stuck and adhere to itself or other tissues. When foam rolling, we also affect the fascia and can release these adhesions, allowing it to glide freely again. How and for how long? If using for general maintenance each muscle (or muscle group – i.e. the quadriceps) should be rolled for up to 2 minutes. So the total time for rolling will depend on muscles you are focusing on for the session. For example, for runners, the calf, quadriceps and hamstrings are key muscle groups to roll. Office workers may find they benefit from rolling their spinal muscles and hip flexors as these muscles are frequently affected by hours of sitting. Gently rolling back and forth to increase circulation prior to focusing in on more specifically tight sections will warm the muscle up first. As a general rule for long muscles – i.e. quadriceps, hamstrings or calf it’s good to start at one end and roll upwards towards your body. It’s important to ensure you focus more on the tight and tender spots in the muscles you are rolling. Roll more slowly and hold at these points until the pain dissipates for maximal benefit. This will help your treatment to be more specific. Ensure you breathe normally and try to relax the muscle you are working on as much as you can. Listen to how your body feels – you will gain nothing from pressing too firmly and can even cause more pain and tightness if you’re too firm or if you spend too long on a painful point. If you have a specific injury, don’t roll it directly, instead try to influence the muscles around that may be tight. You can offload particularly tight or tender areas by putting more weight through your supporting arms or legs. You may also find placing a towel over the roll will make it more comfortable in the first instance. Rolling can be beneficial both pre and post training. Prior, it increases the circulation to the muscles, helping the body to warm up and prepare for physical activity and post it can help to remove the waste products of exercise aiding recovery. In the same way as you may have a post event massage – it should be done gently as its primary focus is not muscle release but its main aim is relaxation and recovery. Fitting a quick 10 minutes after work whilst you wind down in front of the TV may also be useful to release tension from the day and aid your sleep. In terms of rolling for the specific release of muscles, time this on days you are not training heavily, it may be worth fitting 5-10 minutes several times a week to release tightness and help optimise your recovery. If you feel as though even with a large amount of foam rolling you are unable to change your tightness or soreness then it would be best to contact us and see one of our experienced therapists to get a definitive diagnosis on the problem. Occasionally you may not find any change with the rolling therefore the need for a proper diagnosis for the cause of the pain should be explored.